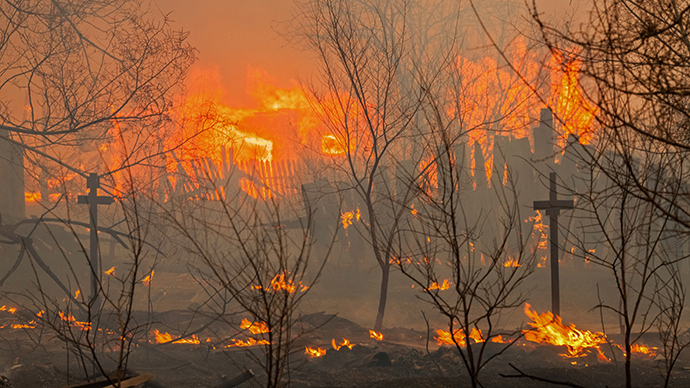 Massive fires in the Siberian region of Khakassia have destroyed almost 1,000 homes in over 20 towns and villages. Fifteen people have been killed, and over 480 injured. A total of 77 people are hospitalized, 11 in serious condition. People setting fire to grasslands have caused the blazes. Strong gusts of wind have aggravated the situation in the Republic of Khakassia, located in the south of Eastern Siberia, on Sunday afternoon. This has prompted the local authorities to declare a state of emergency. “According to the latest figures, 982 houses have been destroyed or damaged,” a source at the local law-enforcement agency told RIA Novosti. Emergency officials added that over 120 people have been injured in the blazes. Over 1,000 people including local residents are fighting the fire. Over 200 fire engines and three fire-fighting trains are aiding them. The Russian Emergency Ministry has prepared two planes and seven helicopters, which will be deployed as soon as the weather conditions improve. In recent years, raging forest and grassland wildfires in Russia have increased. Activists say this is due to a rise in temperatures and a lack of forestry employees.